Succotash is far more popular in the South even though the word comes from a Northern Native Americans (Narragansett). The word comes from the Narragansett msickquatash, which means "a dish of boiled or stewed corn." A typical classic succotash contains corn and lima beans. Just before the dish is ready, butter is added along with some milk or cream. 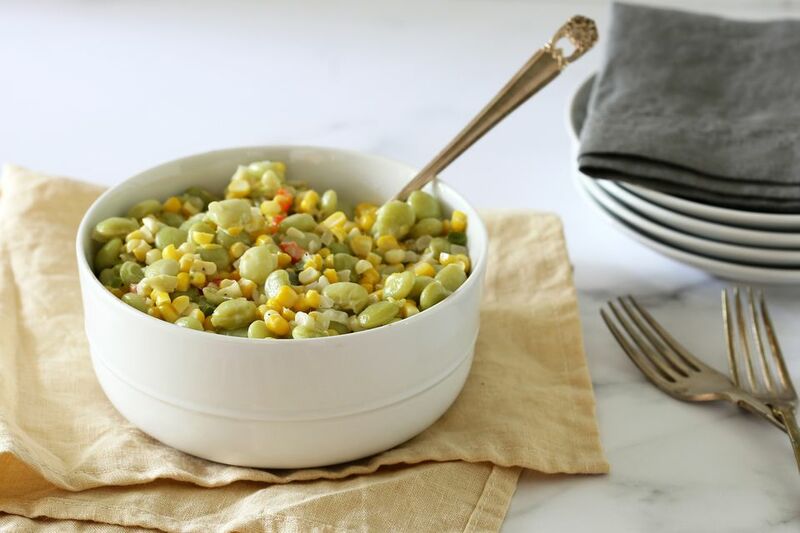 This lima bean and corn succotash is a creamy mixture of fresh and frozen vegetables with heavy cream and complementary seasonings. In this version, butter is used to sauté the onions and peppers, but salt pork, pork belly, or bacon are frequently used in the dish. Feel free to cook some bacon or diced salt pork and cook the onions in that fat instead of butter. Add the crispy bacon or salt pork pieces to the succotash as a garnish. Some other vegetables common in succotash include sliced fresh okra, pimentos, cut green beans, or other kinds of cooked beans. The dish is an excellent side dish that is special enough for a holiday feast, yet easy enough to fix and serve any day of the week. This recipe makes a generous batch, enough for 6 people, and it is easily scaled up for a party or potluck. If you are using fresh corn, cut the kernels off the cobs with a sharp knife and scrape the cobs with the back of the knife to get all of the sweet liquids. If you are using frozen corn, cook them following the package directions and then drain. Cook the frozen lima beans following the package directions. Meanwhile, melt 2 tablespoons of butter in a skillet over medium heat. Add the onion and cook, stirring, until translucent. Reduce the heat to medium-low and add the garlic and bell pepper; continue cooking for 2 to 3 minutes, stirring frequently. To the onion and bell pepper mixture, add the drained corn and lima beans. Simmer the mixture for about 5 minutes. Add the light or heavy cream, the remaining 2 tablespoons of butter, and the salt and pepper, to taste. Heat through. Serve as a side along your main dish and enjoy! Seafood Succotash: Add 8 to 16 ounces of cooked chopped lobster meat or cooked shrimp along with the cream. Creole-Style Succotash: Add a 14.5-ounce can of tomatoes and 1/2 cup of chopped celery to the pan with the onions. Add cooked sliced okra along with the lima beans and corn, and then add some sliced cooked andouille sausage and cooked shrimp just before serving. Season with your favorite Creole seasoning blend.